Three different types of beans go into this delicious Mixed Baked Beans recipe seasoned with bacon. It’s a perfect side dish for barbecues and picnics! 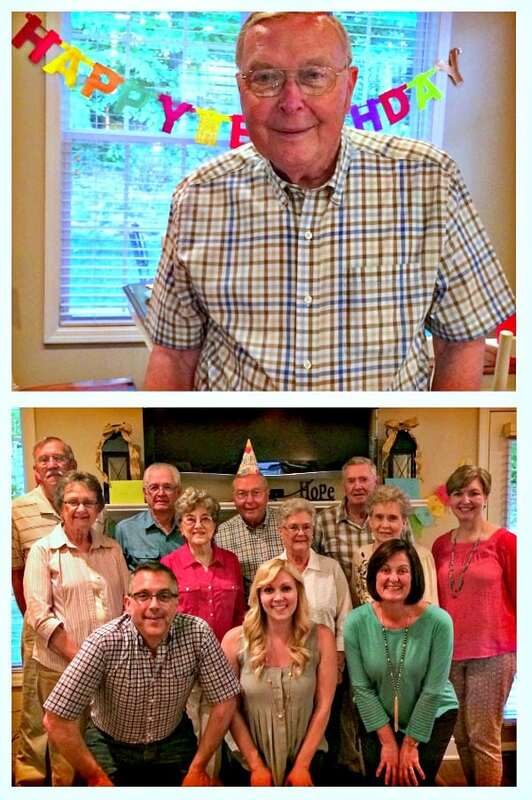 My sweet father-in-law celebrated his 80th birthday this week and we managed to pull off a surprise birthday party over the weekend for a few of his friends and family. I kept the menu simple by serving pulled pork barbecue from DeadEnd BBQ (our favorite local BBQ place!) 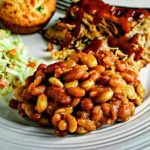 along with my Mexican Cornbread Muffins, Tangy Cole Slaw, and these tasty Mixed Baked Beans, which feature a mixture of three beans, sweet onion, and plenty of bacon. Yum! That’s the birthday boy in the party hat, my father-in-law Cecil. He always calls me his “favorite” daughter-in-law and I always joke back that I’m not sure that’s much of a compliment since I’m his “only” daughter-in-law. He’s been a great influence in my life since I joined the family as I know he has been in the lives of the rest of our clan, his friends, and in his church. We’re blessed to call him our Dad. 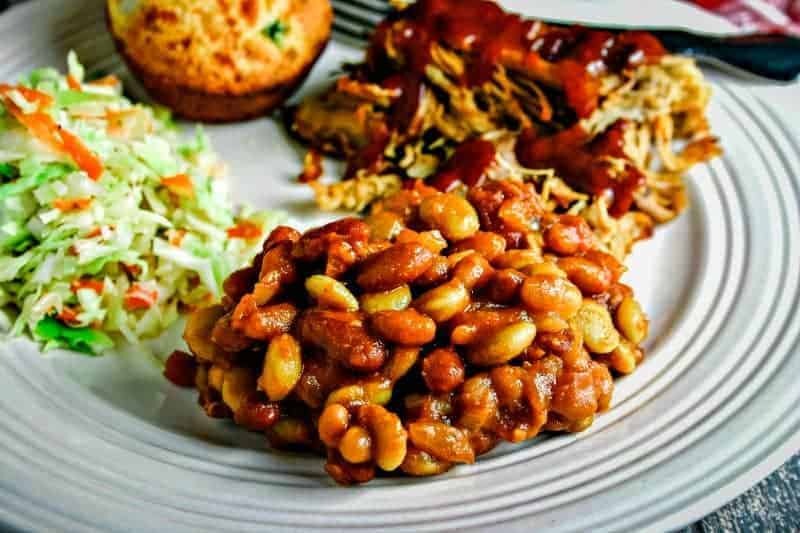 Every barbecue plate needs a side of baked beans, right? What makes these beans special is that they are made with three different beans: the traditional pork and beans, red kidney beans, and baby lima beans. That’s right. Lima beans! Adding in lots of bacon and plenty of sweet onion — sautéed in the bacon fat, of course! — make this side dish extra delicious! Be sure to drain the cans of beans so that when they bake up the sauce will get a little thicker. 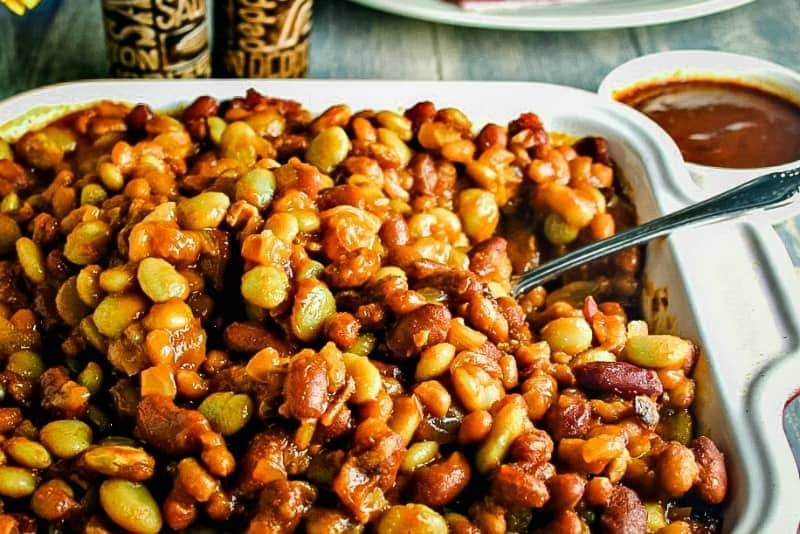 I guarantee you’ll want to try this version of baked beans at your next barbecue or picnic. They’re easy to prepare and the recipe can also be easily doubled for larger groups. It also reheats really well. Happy Birthday, Cecil! 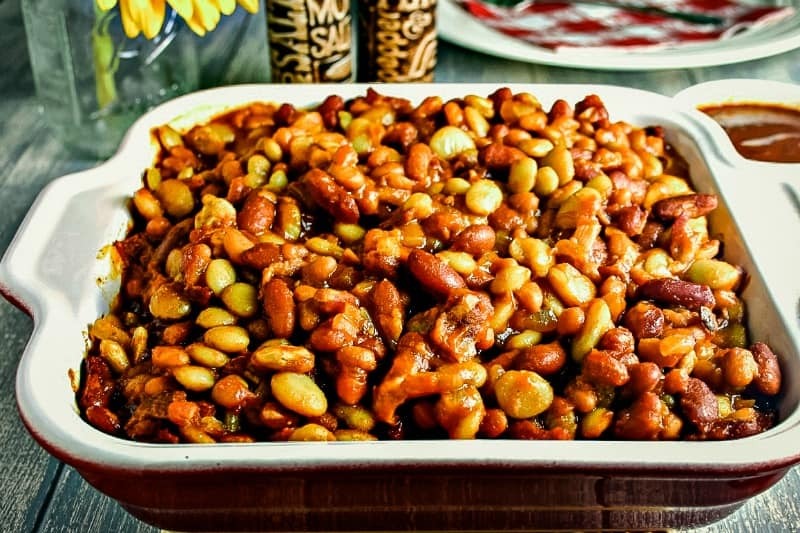 Three different beans go into this delicious Mixed Baked Beans recipe - perfect for barbecues and picnics! Sauce onions in 2 tablespoons of reserved bacon drippings until tender. Combine onion, bacon, beans, and remaining ingredients in a large bowl until mixed. Pour into a lightly greased 2-quart baking dish. 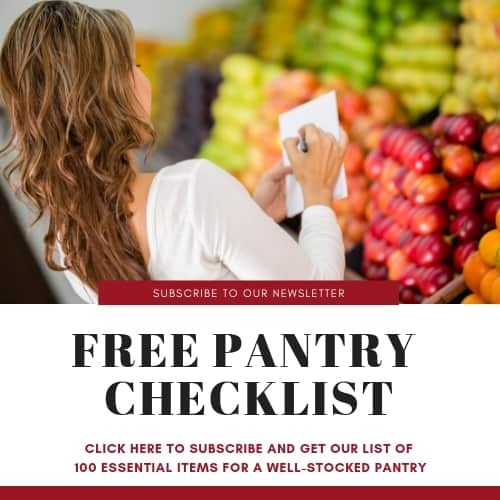 Everyone needs a great Baked Bean recipe! This is perfect for cookouts! Oh yum! I love baked beans, they are a great side for many occasions. These sound delicious! I love baked beans, actually just posted a similar recipe on my blog. 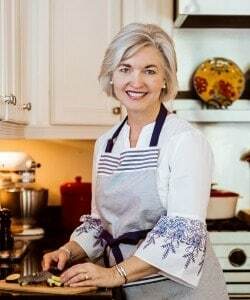 Your recipe looks and sounds delicious. Thanks for sharing, PINNED!! Baked beans and bbq go hand in hand. I love the mixture of beans you used in your recipe. Can’t wait to give your version a try when we bbq next. How fun – hope you had a great celebration! Looks like the meal was something special to enjoy! I love that you used a variety of beans and the seasonings (and bacon) sound great! Your father-in-law is just adorable! And those baked beans… I can just imagine the smell and taste! OOOhhhhhh yum! These beans look delicious! Thank you for sharing!! These sound awesome, LOVE baked beans!